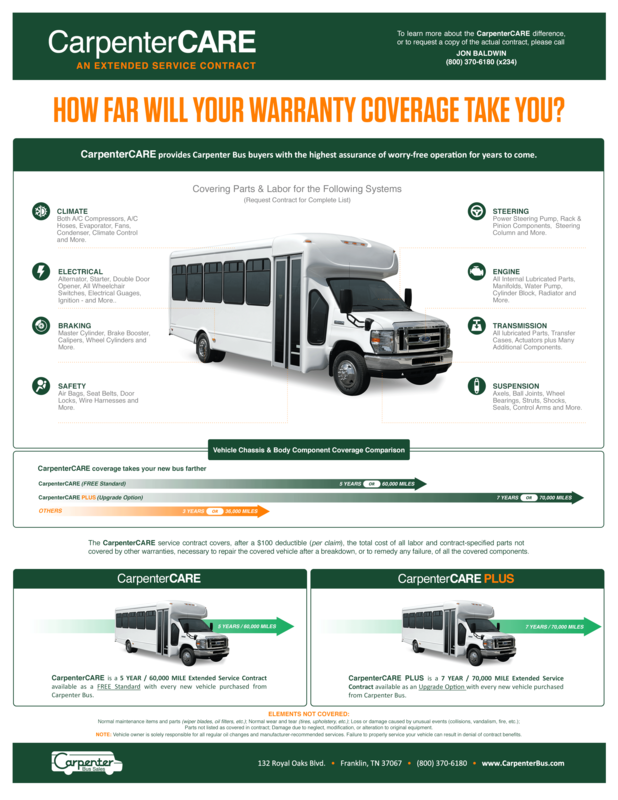 The 5-Year/60,000 Mile Body & Chassis Warranty from Carpenter Bus is an Extended Service Contract that is FREE with Every New Bus & covers the Repair or Replacement, following a Breakdown*, of all Vehicle Parts** and applicable labor, that are not covered by the Manufacturer’s Warranty or other Insurance the Owner of the Vehicle may have. The term of the Vehicle Service Contract is for 5 years or 60,000 miles, whichever shall come first, from the date of purchase. A covered Breakdown is subject to a $100 deductible for each repair visit. The deductible does not apply to towing and/or rental car/substitute transportation coverage(s). *The 7 Year / 70,000 Mile Extended Warranty is identical in scope and service to the 5 Year / 60,000 Mile Extended warranty but is extend an additional 2 years and/or 10,000 miles. Don’t Be Fooled!! All warranties are not created equal. There are lots of Extended Warranties that extend coverage over drivetrain components. But CarpenterCare is the only extended warranty that covers the drivetrain components (Chassis), PLUS the non-drivetrain components (Body), like rear A/C units, electric door motors, lift components, and other items that every bus owner knows to be expensive to repair. Click here for more detail on CarpenterCare. If you have a particular question about this Extended Service Contract, call Jon Baldwin at 615-376-2287 x234, or email him at jbaldwin@carpenterbus.com. * A “Breakdown” of a covered part is defined as “Failure” of such part to meet Manufacturer’s Specifications. A “Failure” refers to the inability of an original or like replacement part covered by the Vehicle Service Contract to function in normal service. ** For a complete list of covered parts, please request a copy of the Service Contract. Not covered are normal wear-and-tear items (tire wear, windshield wipers, etc. ), fuel/oil/lubrication or damage from accidents.